Explore one of the most effective ways to network with professionals in your industry, enhance your career opportunities, and land the perfect job. Whether you're starting a new position, or you've been working the same job for years, these simple tips can help your health career rise to the next level. Jobs in the medical field are consistently in demand, even in periods of economic downturn, but some medical careers are expected to grow faster than others. Explore the Ins and Outs of a career in healthcare and medicine. Healthcare is one of the few industries where job and career opportunities are on the rise. While at times stressful, healthcare is one of the most rewarding of all career fields to work in. This section of our site is designed as a resource for aspiring medical and healthcare professionals. All resources on this page are non-commercial in nature and free to use in any way you find beneficial. Please contact us with any other resources you'd like to see added to this page. To learn more about advancing your career in medicine or healthcare select a topical section below. Figuring out which healthcare career or health occupation to pursue, or simply finding a good job, can be a difficult and time consuming endeavor. This section of our website was developed to help aspiring healthcare and medical students and job seekers make better, more informed career choices by providing them with highly relevant, reliable and up-to-date job search, career development, and employment information. Allied health is one of the largest healthcare fields. Nearly sixty percent of all health professionals work in a field of allied health. And as the demand for allied health professionals and specialists continues to grow this field is predicted to maintain its popularity throughout the next decade. Allied health professionals work directly with patients but may also function in a variety of administrive roles. Most specialists are found working in public and private healthcare facilities including hospitals, laboratories and clinics. However, many manager their own practices or work as part of a team of other specialized medical professionals to determine how to best treat and care for their patients. Most allied health professionals/specialists are either technologists, technicians, or therapists-which technicians being the most popular of the allied health career positions. It typically requires a year or two of formal training to become a technician. Technicians work under the supervision of technologists, therapists as well as doctors themselves. Technicians can be found in just about every allied health field including, but not limited to, respiratory therapy, recreation therapy, occupational therapy, radiology, medical laboratory, and physical therapy. Alternative medical specialists treat people seeking alternatives to surgery, prescription drugs, and other traditional medical procedures. Alternative medical specialists focus more on prevention rather than treatment. They typically recommend nutritional changes, exercise, and stress management techniques to their patients. They believe, if treated properly, the body can heal itself. Many incorporate ancient medical treatments and meditation into treatment plans. Most people studying the arts and humanities during college develop analytical, communication, and research skills that can be used in the healthcare industry. Workers with a background in humanities have the ability to connect with patients and understand how culture affects human health. Yet many people are unaware that many humanities related careers are available in the healthcare industry. Although not considered mainstream by some medical professionals, many people rely on chiropractic medicine. People struggling with joint problems and neck and back pain often consult with chiropractors. Chiropractic medicine is very popular among people who prefer alternative and holistic medicine. Advances in genetic engineering, treating oral diseases, salivary diagnostics, and dental technology make dentistry a satisfying, challenging, and exhilarating career field to work in. Modern dentists are highly trained health specialists who administer numerous oral health treatments intended to eradicate cavities, gum disease, and tooth decay. Problems with the environment can increase diseases, carcinogens, and toxins that humans are exposed to on a daily basis, which in turn causes health problems, such as asthma, allergies, and cancer. Additionally, agriculture grown in contaminated soil and irrigated with toxic water can increase food borne illnesses. Environmental health specialists identify environmental hazards and develop strategies to reduce and eliminate them from the environment. These specialists include public health specialists, environmental health officials, and environmental health practitioners. Environmental health specialists work closely with elected officials, engineers, doctors, meteorologists, biologists, geologists, chemists, and other professionals in an effort to identify and eliminate environmental pollutants. When people think of a career in health, they don't typically think of forensic science, but forensic science is an integral part of the healthcare system. Forensic scientists investigate crime scenes and physical evidence to assist with legal and police investigations. 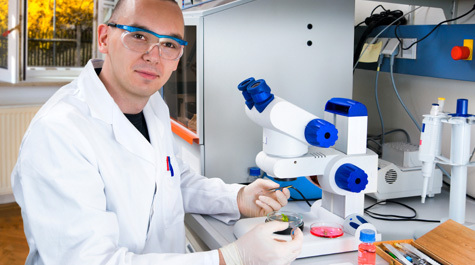 Forensic scientists utilize psychology, math, biology, physics, chemistry, and toxicology while investigating crimes. They also assist people investigating steroid scandals in professional sports, drug use at worksites, and environmental catastrophes, such as toxic chemical or oil spills. The information forensic scientists collect is utilized by various groups, including public health organizations. Gerontologists specialize in human aging. They focus on how people change physically, socially, and mentally as they age. Since life expectancy is increasing, demand for gerontologists is growing. Hospitals and medical clinics are managed like other companies. As a result, qualified administration professionals are needed to fill important management roles. Healthcare administrators and managers supervise, plan, and coordinate delivery of medical services. Medical informatics professionals specialize in information science and technology utilized in the healthcare industry. These specialists oversee technology that is used to store, retrieve analyze, and deliver mission critical health data. Physicians are licensed medical specialists who diagnose disease, administer medical procedures, prescribe medication, and teach patients how to prevent illness. Physicians are classified as MDs (medical doctors) or DOs (doctors of osteopathic medicine). MDs are trained in allopathic medicine, while DOs are trained in osteopathic medicine. Mental health specialists assist people struggling with mental health disorders, relationship issues, and emotional problems. In addition to correcting problems, they teach patients how to prevent them. Mental health professionals assist children, adolescents, and adults. Those specializing in counseling work with individuals, couples, and groups. Many mental health professionals specialize in marriage, substance abuse, career, and family counseling. Nurses assist patients in hospitals, encourage healthy practices, and administer medical procedures. 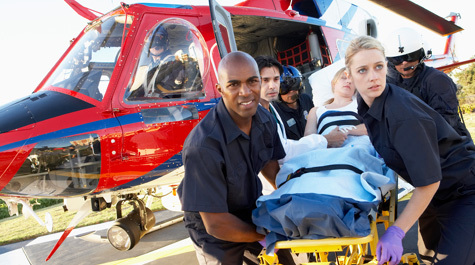 They're often members of healthcare teams that provide direct patient care. There are numerous specialties and career opportunities within the field of nursing. Nurses also work as patient advocates and raise awareness about various public health problems in their communities. They design and oversee nursing care plans, teach patients about disease prevention, and assist doctors with various procedures. 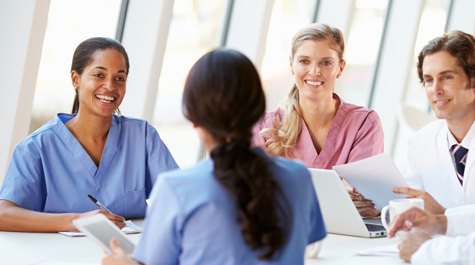 Entry-level jobs for nurses can be obtained with a diploma or associate degree in nursing, which usually takes 1 to 3 years to complete, but most organizations prefer to fill nursing positions with applicants holding a bachelor's degree in nursing. Registered nurses (RNs) interested in upgrading to a master's degree can complete a RN-to-MSN degree in nursing. Nutrition is an important component of health. Dietary changes can reduce the risk of heart disease, obesity, diabetes, cancer, and other metabolic disorders. Dieticians specialize in the link between health and nutrition. Dietitians develop nutrition plans for people struggling with disease and other health problems. They often design preventative health nutrition plans. Occupational therapists help injured and disabled people become and remain productive in the workforce. They also teach clients how to live more independently. Specifically, they design individual productivity improvement programs for disabled, injured, or ill individuals, examine clients' homes and worksites for impediments, administer performance tests, teach clients how to use adaptive and assistance equipment, and counsel clients' family members about proper care for loved ones. Optometry professionals specialize in the anatomy and diseases of the eye. They are licensed to diagnose and treat eye diseases and vision impartment. Pharmacists are licensed professionals who dispense medication and answer questions about proper dosage and usage. They are assisted by pharmacy technicians and aides. Since pharmacists dispense narcotics and other addictive substances, they're responsible for monitoring patient subscriptions. Physical therapists utilize massage, exercise, traction, and other therapies to help people recover from serious injuries and illnesses. They work with individuals recovering from car accidents, sports injuries, combat wounds, strokes, and various other maladies. Podiatric medicine (podiatry) professionals specialize in treating problems affecting feet and ankles. They often specialize in orthopedics, pediatrics, geriatrics, biomechanics, sports medicine, and surgery. Since a growing number of people suffer from ankle and feet problems, the demand for podiatric doctors is on the rise. Public health specialists educate communities about injury and disease prevention, raise awareness about communicable and other diseases, and conduct research to improve public health. Unlike doctors, public health specialists work to prevent disease, rather than treat it. Public health professionals may specialize in emergency and disaster preparedness, health services administration, epidemiology, environmental health, occupational health, nutrition, child health, global health, biostatistics, behavioral science, and health education. Speech language pathologists, audiologists, and other hearing science specialists diagnose and treat hearing disorders. Many conduct research in an effort to design and improve hearing assistance technology. Others specialize in the treatment of individuals with hearing loss, language delay, and speech problems. Sports medicine specialists teach athletes how to properly recover from and prevent injury. They also help athletes improve their mental and physical performance. Sports medicine is growing in popularity as a career. In addition to assisting athletes, sports medicine specialists work with non-athletes recovering from injury, individuals striving to get in shape, or those training for marathons. They also teach people with disabilities how to exercise properly. Veterinarians are primarily responsible for diagnosing and treating injured and sick animals, but they also fulfill other roles. Many veterinarians are researchers that identify similarities between certain animal and human diseases, including the avian flu, West Nile virus, and mad cow disease. Veterinarian medicine can prepare one for research that can improve human, as well as animal health. Search our database of online and campus-based health degrees and programs. Earning a bachelor's degree is the first step to a career in healthcare. Many positions now require either a bachelor's, master's or professional degree. In the section below, you'll find links to comprehensive directories of health and medical employers organized by state and city. The directories are designed to help health and medical students, professionals, and practitioners quickly location and apply to job openings located throughout each state. For current job openings, simply click on the "apply" link located directly to the right of each listing. For more general career and job information, click the "learn more" link. You can find contact information for each employer, including address and phone number, by positioning your cursor over the instituation's name. According to the U.S. Bureau of Labor Statistics, as of May 2014, there were approximately 7,854,380 individuals in the United States employed as healthcare practitioners and technicians. There were an additional 3,940,500 professionals employed as healthcare support assistants, aides and workers and 310,320 professionals employed as medical and health service managers. The mean hourly wage for healthcare practitioners and technicians is $36.54. The mean hourly wage for medical and health service managers is $49.84. The mean hourly wage for healthcare support professionals is roughly $14 an hour. 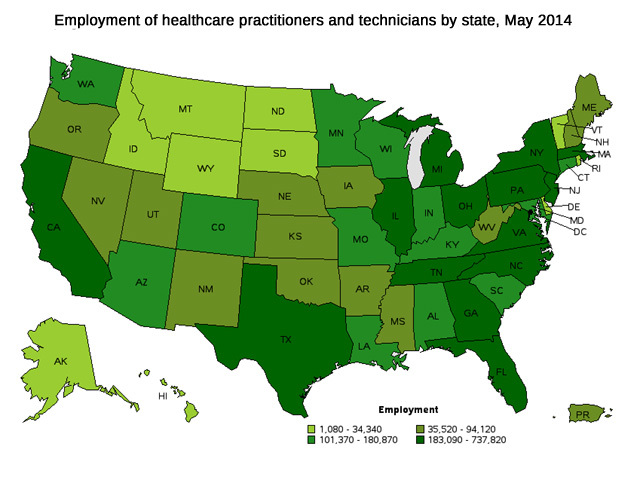 The map below show the states with highest levels of employment for healthcare practitioners and technicians. The employment table below shows the states that employ the highest number of healthcare practitioners and technicians. If you take the total employment number and divide it by the state's total population, you'll get the ratio of healthcare practitioners to consumers. This ratio is a useful indicator when considering practice areas. The map below shows the location quotient for healthcare practitioners and technicians by state. The location quotient is the ratio of concentration of healthcare practitioners and technicians employed in a state to that national average concentration of healthcare practitioners and technicians. 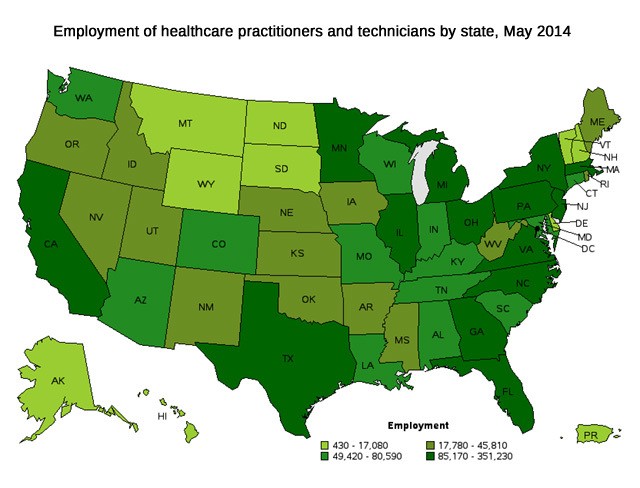 A state with a location quotient greater than 1 employs a higher number of healthcare practitioners and technicians than the national average. The map below show the states with highest levels of employment for healthcare support workers. The employment table below shows the states that employ the highest number of healthcare support workers. If you take the total healthcare support workers employment number and divide it by the state's total population, you'll get the ratio of healthcare support workers to consumers. This ratio is a useful indicator when considering practice areas. The map below shows the location quotient for healthcare support workers by state. The location quotient is the ratio of concentration of healthcare support workers employed in a state to that national average concentration of healthcare support workers. A state with a location quotient greater than 1 employs a higher number of healthcare support workers than the national average. The map below show the states with highest levels of employment for medical and health services managers. The employment table below shows the states that employ the highest number of medical and health services managers. If you take the total number of medical and health services managers and divide it by the state's total population, you'll get the ratio of medical and health services managers to consumers. This ratio is a useful indicator when considering practice areas. 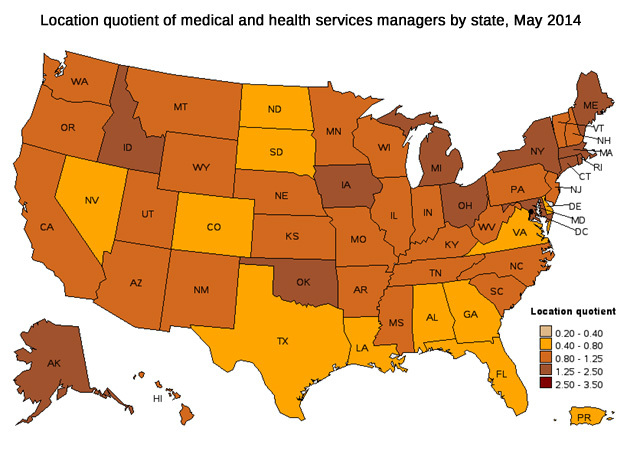 The map below shows the location quotient for medical and health services managers by state. The location quotient is the ratio of concentration of medical and health services managers employed in a state to that national average concentration of medical and health services managers. A state with a location quotient greater than 1 employs a higher number of medical and health services managers than the national average. If you're looking to maximize your earn potential, there are several factors to consider. The largest factor influencing how much you can earn as a healthcare professional is your area of practice and specialty. Obviously, a neurosurgeon with an advanced medical degree is going to earn more than a registered nurse. The second most important factor influencing earnings is location. Healthcare and medical professionals working in metropolitan areas typically earn more than those working in rural areas. For example, a registered nurse working in Kansas, is going to earn much less than their counterpart working in San Francisco, California. 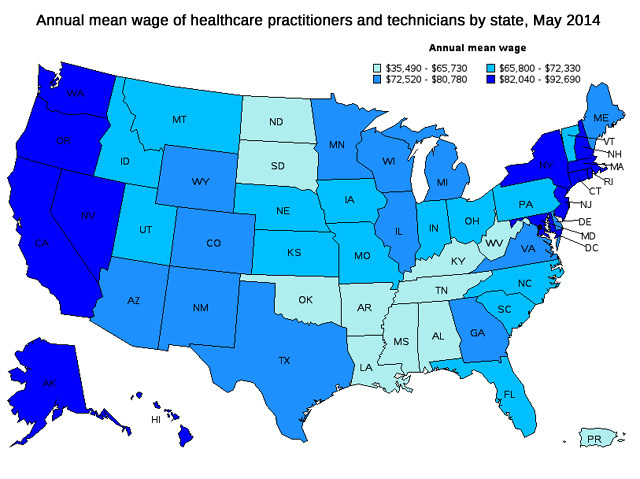 The map below shows the annual mean wage for healthcare practitioners and technicians by state as of May 2014. The table below lists the states that offer the highest earning potential for healthcare practitioners and technicians. 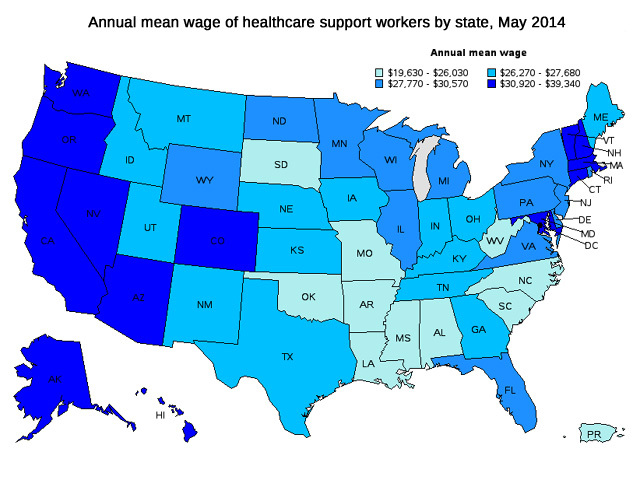 The map below shows the annual mean wage for healthcare support workers by state as of May 2014. The table below lists the states that offer the highest earning potential for healthcare support workers. 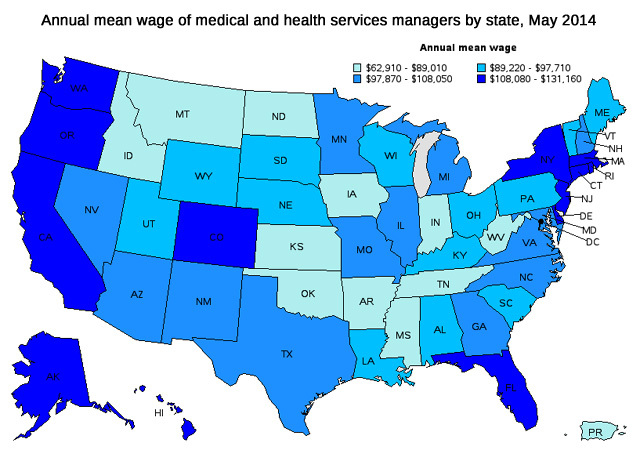 The map below shows the annual mean wage for medical and health services managers by state as of May 2014. The table below lists the states that offer the highest earning potential for medical and health services managers.